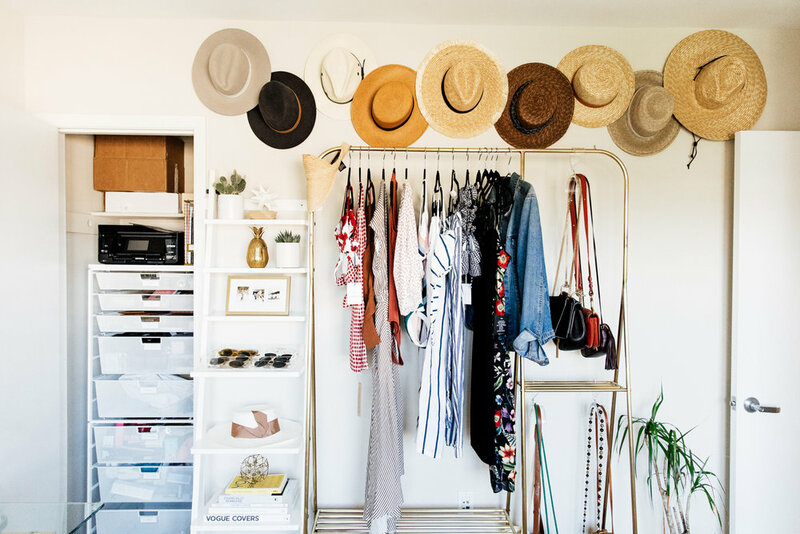 SO excited to share my office + closet refresh! I've worked from home for 4+ years and now I finally have my own space to get sh*t done. To be honest, I've had this second bedroom for a minute and called it "my office" but it was ALWAYS a disaster; clothes, shoes and boxes everywhere with absolutely no organization. Check out my IG TV video to see the BEFORE - eek! Since I brought on my right hand gal full-time (Hi, Marissa!) I knew it was time to whip the Pursuit Digital home office + closet into shape. With some serious home organization from the Life in Jeneral team, desks from Urban Outfitters, prints and accessories from Society 6 + Wilder California, and some DIY action... my office is complete. Keep scrolling for all the details including step by step details for the DIY hat + collage walls. Fun fact: the neon sign is from our wedding. Also don't forget to check out my IG TV vid with all the BTS. The first step in my refresh was having Life in Jeneral come over and get me ORGANIZED. Aside from my old "desk" which was a table, we kept all the existing furniture that was in my OG office and created systems to help keep things organized. One of my biggest issues is the amount of unsolicited boxes and product I receive. They were starting to pile up everywhere, so the LIJ team transformed what was originally my denim/sweater/handbag closet into a super organized set of drawers. Using the ELFA system from The Container Store they created designated drawers for boxes, product, giveaways, electronics, and more. They moved my handbags to my clothing rack (sold out, sorry! try these though.) and utilized the coolest acrylic purse organizers to hang them! We also decided ONLY clothing that needed to be blogged about would live on the clothing rack, everything else would go into my sliding door closet located on one of the walls in my office. Another game changer was figuring out what to do with my bathing suits. You guys, I have over 100 bathing suits (after I purged!) and with it being the summer season they were scattered everywhere. Enter clear drawer dividers and file folding of all my bathing suit into my dresser. They even put them in color order AND separated them by bikinis and one pieces. Yes, they took up two full drawers! I swear, since they came and organized my office (they also did our bathroom + kitchen), Andy and I have been much more cognizant of staying organized and tidying up after ourselves. It truly makes a world of difference especially when you wake up in the morning and walk into an organized house! This came to me in a dream... haha, not really, I think it was a combination of perusing pinterest and wanting to find a way to re-use the neon sign from my wedding! (deets on that here). I wanted the vibe to be a mix of wanderlust, inspiration, and artistic photos from our wedding. From there I decided what prints to order! Honestly the # of prints was all a guess but it ended up working out. For the neon sign we actually just eyed it and used nails to hold it up! Pillows - one of my favorite things about S6 is that almost every print/photo comes in a plethora of products: pillows, coasters, prints, serving trays, comforter, etc. so it's easy to merchandise a room based on a style or color. I have this serving tray on my dresser and also got it in a pillow for the chairs! Coasters - this is also the same print as one of my pillows and serving trays. You all know I need a coaster for my daily Starbucks! As I mentioned above, I didn't go to crazy with new furniture because this was truly a refresh! The only new pieces I got were our desks. When I spotted this desk on Urban Outfitters I knew it would be perfect for the space. It is actually pretty big but the glass and minimal design make it look a lot more compact than it is. I love how it clean it looks! Chairs are Eames knockoffs (oops!) and you can get them here. If you watched the IG TV vid then you know the hat wall actually already existed just on a different wall. 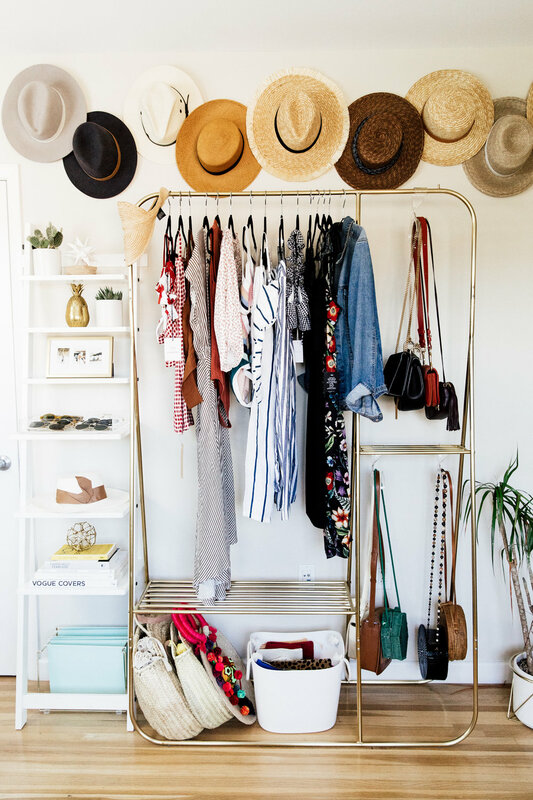 Hat walls are my FAVE because they look amazing and they're SO easy to do. All you need are nails, a hammer, and hats. You can design it however you want - across, up and down, totally staggered. I honestly don't get too scientific with it, just start nailing in the center and go out on each side. That's it!